I love Beth Kephart's writing. I love every lyrical, magical, evocative word of it. I wallow in a Kephart book, marvel at the way she uses language like a paintbrush, eat up her daily blog posts like part of my healthy breakfast. So how happy am I that she has finally written a book about writing? 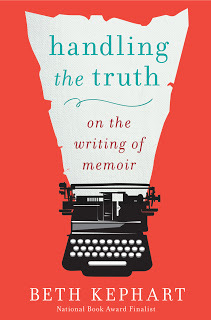 Handling the Truth distills the wisdom from Kephart's own experience as a writer of memoir, from her class at the University of Pennsylvania, and from the work of those writers whom she most admires. It's chock full of sound writing principles and imaginative exercises, set out in a systematic way to prepare you for the actual writing of your memoir. If you follow it, you will have a firm foundation for writing your personal story. But what I love most about Handling the Truth is that it reveals a side of Beth Kephart I've not seen before. She is fierce in this book, like a mama bear protecting her cub. 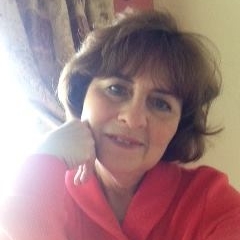 Kephart has written five memoirs of her own, each one astoundingly good, each one proving anew her passion for this genre. And throughout handling the truth she exhorts all of us - we fledgling, aspiring memoir writers - not to take this work she loves and mess it up. In the opening pages, she gives us a forthright and adamant list of what memoir is NOT - not "a lecture, a lesson, a stew of information and facts." NOT "a self-administered therapy session." NOT "an exercise in self-glorification." NOT a "trumped-up, fantastical idea of what an interesting life might have been, if only." What must we do, then, in order to write the stuff of our lives that is good and strong and true? The stuff that speaks? Real memoirists "open themselves to self-discovery," she says, "and, in the process, make themselves vulnerable...They yearn, and they are yearned with. They declare a want to know. They seek out loud. They quest. They lessen the distance. They lean toward." Makers of memoir "shape what they have lived and what they have seen. They honor what they love and defend what they believe. They dwell with ideas and language and with themselves, countering complexity with clarity and manipulating time. They locate stories inside the contradictions of their lives...they write the stories once; they write them several times. (...) And when their voices are true, we hear them." If there is something in your mind that's been "teasing you for years," if there is "some small thing that won't be refused," if you are brave enough to take up the memoir standard, then Handling the Truth is the book you must read. I have purchased a copy of Handling the Truth to give away to an interested reader. Simply leave a comment with the name of your favorite memoir. Winner will be chosen at random on August 18.